Playwright Arthur Miller was directed by his daughter, the film director, Rebecca (wife of Daniel Day Lewis). 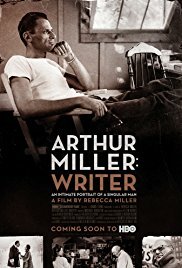 There is a great deal to be interested in with the biography and study of Arthur Miller. There is quite a range of talking heads including Tony Kushner and Mike Nichols, as well as his children. There is a great deal of home movie material to be incorporated into the film, from early years, from his first marriage to Mary, the Marilyn Monroe years, his marriage to Inga. The film fills in the background of his parents and their migration to the United States, his father and his work, the nature of his parent’s marriage and relationship, the Jewish background. The film highlights his university work, the beginning of his writing, difficulties, succeeding, the emergence of such plays as All My Sons and then the dramatic impact of Death of a Salesman. This was the 1940s. During the 1950s, there was his response to Mc Carthyism with The Crucibleand A View from the Bridge, . The mid 1950s also saw his marriage to Marilyn Monroe, an interesting perspective on Marilyn herself, what she hoped from the marriage, what she hoped from Miller, her career, decline and fall, his writing The Misfits for her. The film focuses on his third wife, Inga, her background, her professional skills with the camera, the bonding with Miller himself, the passing of the years. Attention is given to his later plays including After the Fall and his continuing to write into the 21st century. An arresting contribution to understanding the playwright and the background to his work, his work ethic, his understanding of theatre, his love for words. 1. Audience interest in Arthur Miller? American audiences? 20th-century audiences? Universal? 2. His reputation, in the theatre, the film versions of his plays, as a writer? His personal life? 3. Rebecca Miller, a tribute to her father, love, regard, the home movies over many decades, interviews with him, the past and the various periods of his life? Later? The visual and audio portrait? 4. The chronology of his life, a portrait and biography? 1925 -2015? Nine decades? 5. Audience knowledge of his work and life? Experiences in viewing Miller’s plays? The films? Admiration, like, dislike? Questions about Marilyn Monroe and the marriage? 6. The background, European Jews, coming to America, his father, as a boy, settling in New York, sewing, not able to read, yet his business sense, prospering at a young age, the 20th century in the 1920s? His wife, her education, her birth, the arranged marriage? The Wall Street collapse, her disappointment in her husband? The children? 7. Kermit, older, his life and memories? Joan, her memories? Their families? 8. Arthur Miller and his work as a labourer, in factories, saving up money to go to Michigan, moving out of Brooklyn? Mary, the relationship? His jobs, along with his study? His writing plays, prizes? Marriage? The transition to New York? 9. Mary, a portrait, in the film clips, her support, the nature of the relationship, the children, whether Miller was a satisfactory father or not, his own view? The separation? 10. The initial failure of his play on Broadway? Taking more time to write All My Sons? The influence of his experience of his father? Its success, awards? The move to Death of a Salesman? Acclaim? The discussions of its themes? American tragedy of the 1940s? 11. Kazan and his direction? The visualising of the play, the photos with Lee J. Cobb, Arthur Kennedy, Mildred Dunnock, Cameron Mitchell? 12. The interviews with Mike Nichols and his observation of Miller, his career, from Nichols own career? From Tony Kushner, the theatre perspective? Their admiration for Miller? 13. Miller and his work ethic, production, writing, his use of language, ordinary, yet able to create contemporary tragedy? 14. Marilyn Monroe, his meeting her of the film is set, the attraction, his urge to protect her, his keeping propriety? No mention of Joe Di Maggio? Marilyn as vulnerable in the mid-50s, her fame, his assessment of her, her self-image, sad woman? Her response to the media? Publicity? Miller helping, rescuing her, marrying her? Their life together, the sharing? The House Un- American activities? His reflections on their life together, the many sequences? The separation, writing The Misfits? Her performance, not arriving on time, days off, pills and rehabilitation? 15. Writing The Crucible, his perspective on the Mc Carthy era? The scenes of Mc Carthy interrogations? Robert Taylor, Elia Kazan, the decisions, his contempt for the house enquiry? Fined? Suspended sentence? His reflections on Fascism? 16. A View from the Bridge? The playback New York Italians? Family relationships? The comments on After The Fall, whether it is about Marilyn Monroe or not? 17. The interviews with Bob and Jane, Miller’s son and daughter, their life with their father, their mother? Bob and his working with his father, Producing The Crucible? The nature of the interviews on the image of their father? 18. Meeting Inga, her background, photographer, the history, the accent, active, married for 35 years? Her history in Europe, the travels? Her giving birth to Rebecca? 19. Miller’s career, the further plays, his continued writing, becoming older, going out of fashion? The glimpse of the play about Peter and Peter Falk’s presence? 20. Sequences at home, work, in the garden, woodwork, his reflections? 21. No mention of his grandchildren or of Daniel Day Lewis, his son-in-law, except for the clip from The Crucible? 22. His age, living in Connecticut, not going to the city, the outdoors, nature, his work? 23. The film as a tribute, his achievement, his talent, as a person?